A recent food hunt trip down south landed at the city of Johor Bahru at October Japanese Cuisine. This quaint Japanese restaurant is located in bungalow with a little Japanese Zen garden filled with cherry blossoms and bamboo on the side of the restaurant. Behind the restaurant, there is ample parking space for customers. the dining room with much comfort and Zen notes. 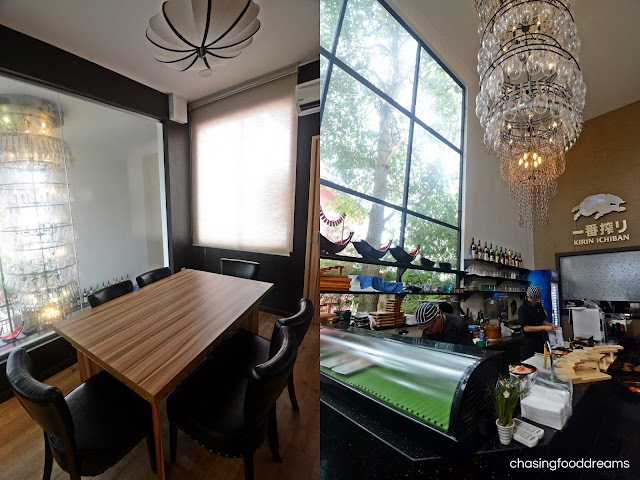 There is a Sushi bar set at one corner of the room where one can catch some chef actions else make a reservation for private dining available at the next level of the restaurant. The menu is fine and offers diners a decent array of classic Japanese dishes to some modern updated ones. Joining this festive season of the coming New Lunar Year, October Japanese is offering their Japanese version of Prosperity Yee Sang Assorted Sashimi with Wasabi sauce (RM108 – Large | RM68 - Regular). 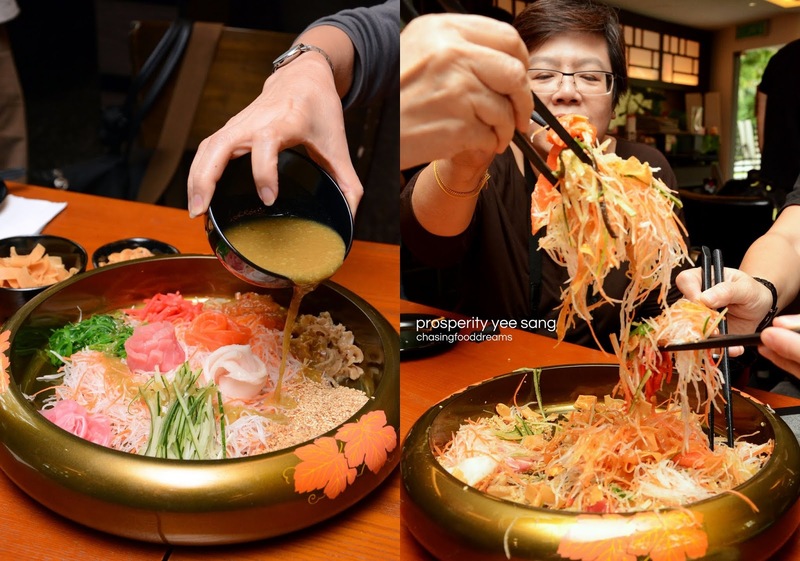 October Prosperity Yee Sang is loaded with Norwegian salmon, tuna and yellowtail sashimi slices. Besides some of the usual vegetables and pickled vegetables, there is also jellyfish Chuka Kurage and scallop Chuka Hotate as well as crispy fried gyoza skin and roasted almond flakes. Diners also have the option to go for Sour Plum Sauce if Wasabi Sauce is not to their liking. 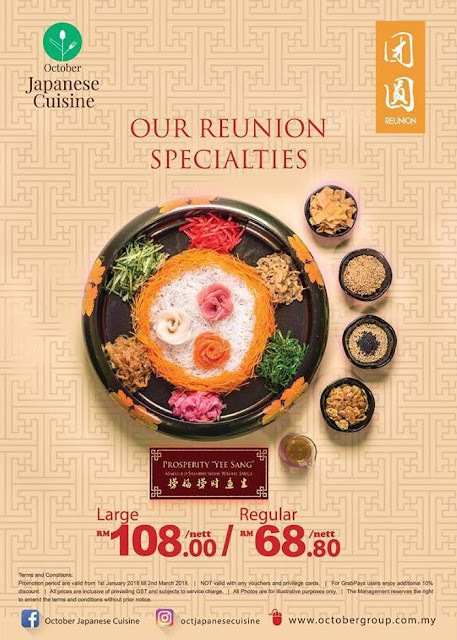 The yee sang is delicious with the unusual addition of the Japanese ingredients. The wasabi sauce gave the yee sang an unusual tingling zing that elevated the lightness of the dish as well as the flavours. Besides the yee sang, October is also offering two more dishes for the coming CNY. The Fortune Sushi and Sashimi Platter (RM58.80) is beautifully presented in an elevated stand holding six varieties of sushi and three varieties of sashimi. Showcasing classic seafood sashimi such as salmon, tuna, yellowtail, squid, prawn and more, this platter is deliciously exquisite and pretty at sight. The Auspicious Flaming Nabe (RM68.80) boasts of luscious slices of Norwegian Salmon paired with chicken and vegetables in rice wine infused broth. Served in claypot, the whole dish was flambéed up in front of us as well as heated on the mini stove. The broth was strongly laced in the ‘Kao Liang’ rice wine, perhaps too strong but flavour is certainly present in a big way. The salmon and chicken are nice and tender while the vegetables gave the over dish a comfort and familiar note. Great with steamed rice or even noodles. We also savored some of the dishes from their regular a la carte menu. Best enjoyed with sake, both appetizers of Grilled Edamame (RM9.90) and Kawahagi (RM12.90) were deliciously yummy. The Grilled Edamame had the classic edamame coated in a spicy and smoky Japanese Togarashi seasoning, making it moreish and addictive. The rich and deep oceanic essence from the toasted dried thread-sail filefish, more commonly found in Shizuoka coastal area, was unique and an acquired taste that turn out to be pretty savory, crispy and sumptuous as small bites especially for those who loves beer and sake. Tempura Sweet Potato (RM9.90) is another appetizer that one should try as it is a specialty at October. Expect creamy and sweet mashed sweet potato and powdery mashed yam encased in thin crispy tempura batter served with generous drizzle of mayo. Good for a start but share this as it can be quite filling. Grilled Squid or Surume Ika (market price) also makes good appetizer with its lightly sweet and smoky flavours on the tender large squid. 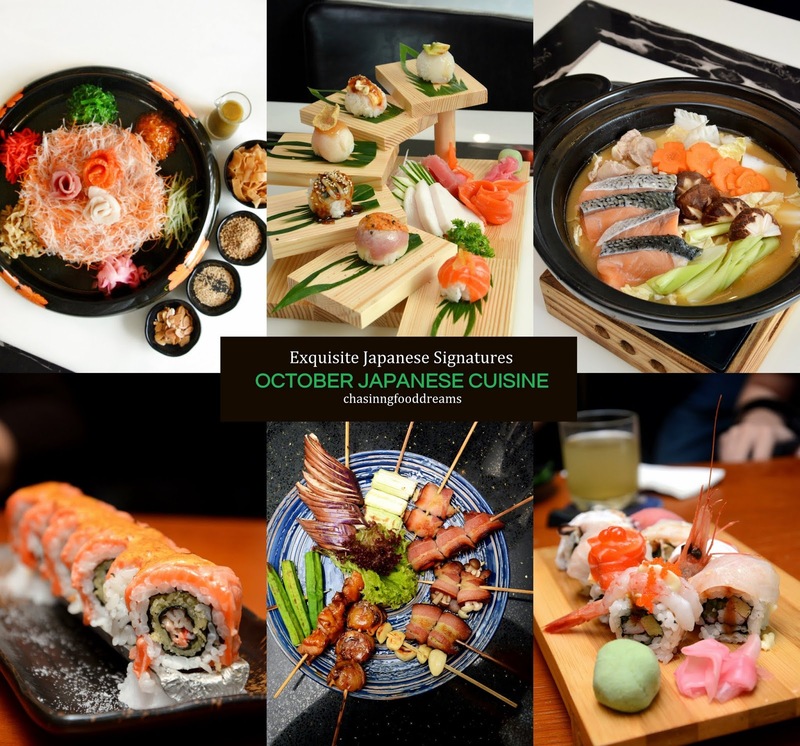 Variety is the spice of life and October Special Bento (RM59.90) certainly made our dining experience more interesting with 6 dishes served in bento box. Value for money, this one may even be sufficient for 2 small eaters with its generous offerings of Chicken Karaage, Salmon Sashimi, Oden, Salmon Teriyaki, Tsukune or chicken meat balls and Unagi Kabayaki as well as steamed rice, miso soup and fruits. There are plenty of house special maki rolls to choose from in the menu. First one up was a Flaming Salmon Aburi Maki (RM29.90). Torched and flamed at table side, this salmon draped crab stick roll with spicy sauce proved to be a sure-crowd pleaser for its flavours. Smoky, creamy and spicy, the roll is sublime! The Special October Maki (RM49.90) features various raw seafood such as sweet shrimp, salmon, yellowtail, tuna, salmon roe and more over crabstick and tamago roll. Though nothing extraordinary, the roll is still really scrumptious because of the variety of seafood on it. The Salted Egg Soft Shell Crab Maki (RM26.90) was rather unique and geared towards our Malaysian palate since we love salted egg so much. The crispy soft shell crab is delightfully yummy while the salted egg sauce gave it a boost of umami notes. For those who enjoy grill skewers of meat, the Kushiyaki Moriawase (RM44.90) offers 10 skewers of various meat and vegetables to go with beer or sake. From chicken to scallops and bacon to eggplant, lady fingers, mushrooms and leeks, the platter offers a nice selection for those who enjoy variety. Last but not least, Japanese Fried Noodles (RM19.90) enveloped in egg omelette proved to be a good dish, especially for noodle lovers or as carb fillers. Terror Billy Jacket Really interesting blog about Japanese Foods and there restaurants. I heard so much good reviews about there Seasfood dish sushi; its really much famous all around the world.